If you want to get information about meets and items such as our upcoming alumni weekend in April, you could join our Facebook page. Search for the group "Spiked Shoe Society" and then join us. You should have just received this letter via e-mail, but just in case here are all the details (right click if it doesn't open initially) for the April 1 - 3 reunion. We need you to send me what events you will be attending and send in your check to reserve your spot TODAY. The reunion already has 75+ signed up as it will serve as a way to honor Matt Lane and Roy Chernock who will be inducted into the Hall of Fame on April 2nd and to celebrate Dan Stimson's 25 years at W&M. 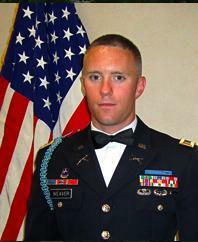 Junior Brandon Heroux started a website to honor Lt. Todd Weaver '08 who recently died while fighting in Iraq. He and some other athletes are trying to raise money for Lt. Weaver's family. You can find more information here. If you want more instant results from meets, you could sign up for a few Tweets from Coach Walsh (look at the lower right of this page). Since we are still waiting for the entire meet results to come in, you can already see the results. When I first qualified for the NCAA meet, a bunch of alums went and watched us at the meet. One of them was W&M's best ever 800 yard runner (and his time would still beat every 800 meter runner - 1:45.91 is his conversion to meters). As someone who lacked any noticeable speed I was enthralled meeting him. Here is a great race where he is 4th in 4:00.1 to Marty Liquori who won and Prefontaine who was second. Thanks to John Malone '81 who pasted it on his Facebook page. The men's and women's teams returned to action in a limited fashion this weekend. Thanks to the quickness of the Internet, I no longer subscribe to T&F News, so thanks to Shelby Hawthorne for the update that Ed Moran ranked 5th in 2010 in the 5K and 10th in the 10K and Kathy Newberry 10th in the marathon. Ed Moran finished 15th at the Bupa Great Edinburgh XC race running in 26:38 in what was a snowy and apparently very tactical (re: slow) 8K race. Check out this video to see how much snow was on the course. You will soon be getting our semi-annual newsletter in the mail. Or you could read it by clicking here for a pdf version or here to see a larger version of what is above.